Andrea Giovannini in Piazza del Popolo, in 2012. 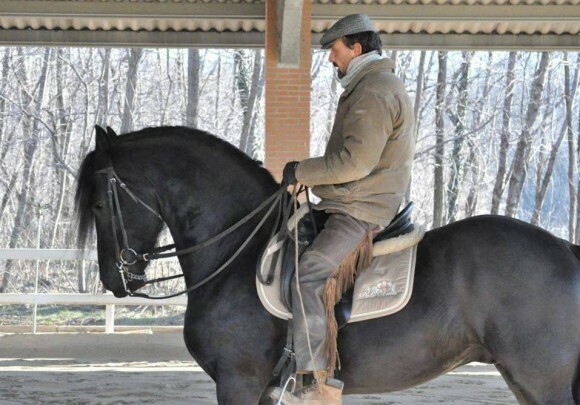 There are historical reasons why, in our country, even though Italy has been the cradle of equestrian academic art, we have lost the tradition of classical horsemanship. Between the nineteenth and the twentieth centuries, Italy was the epicenter of a real revolution in the equestrian field. It is at that time that Federico Caprilli devised a new way to approach obstacles and invented the modern jumping-seat. As with any genuine revolution, Caprilli’s “natural method” established itself in clear opposition with what came before. Viewing the effectiveness on the race fields, in Italy and elsewhere, everybody became “caprillian” and this meant first of all anti-academic. Since followers usually tend to be more radical and dogmatic of their masters, as time went on, in Italy a sort of real hostility to classical dressage became apparent. If to this situation we add that, in the past decades, the Italian Equestrian Sports Federation and the various agencies, which were supposed to be devoted to the promotion of Italian horse breeds, have systematically neglected the transmission of the equestrian culture, it is easy to understand how we came to forget our heritage. For a long time, the Italian official equitation, that of horse shows and three day eventing, has despised (and in many cases still despises) the lovers of classical dressage. At best, considering them to be extravagant conservatives, but in the worst, branding them as circus riders (forgetting that also Baucher performed for years in a circus). On the other hand, it is also true that those who, in such a hostile environment, became passionate of the baroque forms of Iberian horses and dreamt of the elegance of the horses portrayed in the engravings of old treatises, until a short time ago, in Italy had to learn as autodidact as they could find very few teachers to teach the subtle art of riding in the classical style. Consequently, apart from a few isolated cases, the average level of those riders in Italy who called themselves “classic” was, for a long time, quite mediocre. Only a few enlightened riders had the culture, the sensitivity and the means to travel abroad to seek the live ferments of authentic academic riding. Today it seems that the background is slowly, but significantly, changing. 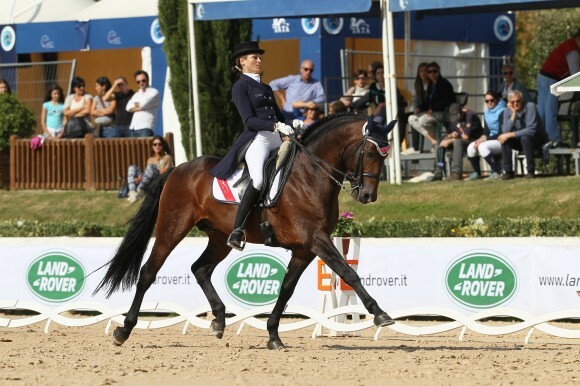 There is a new generation of Italian riders who are stubbornly emancipating from the amateurism that unfortunately characterized the practice of classical dressage in Italy in years past. This new generation is made up of young people who have had the humility and the obstinacy to study, to work hard, to look for the best teachers, and to progress together with their horses. I think, for example, to Eva Rosenthal who grew up in the school of the great Portuguese master Luis Valenca. Eva has proven to be a complete rider, capable of ranging from high school to dressage, achieving exciting results in the Italian Dressage Championship, in the Iberian Master, the national and European competition reserved for Iberian horses, and traveling to participate in the WEG in Aachen, in 2006. Excellent results are also those achieved by Andrea Giovannini. With his six year old PRE mare Soelada, that he trained from the beginning, last October he was up on the podium twice in the Italian Dressage Championship in Arezzo, winning a silver and a bronze medal. These were in addition to the many other successes he has achieved on the race fields. 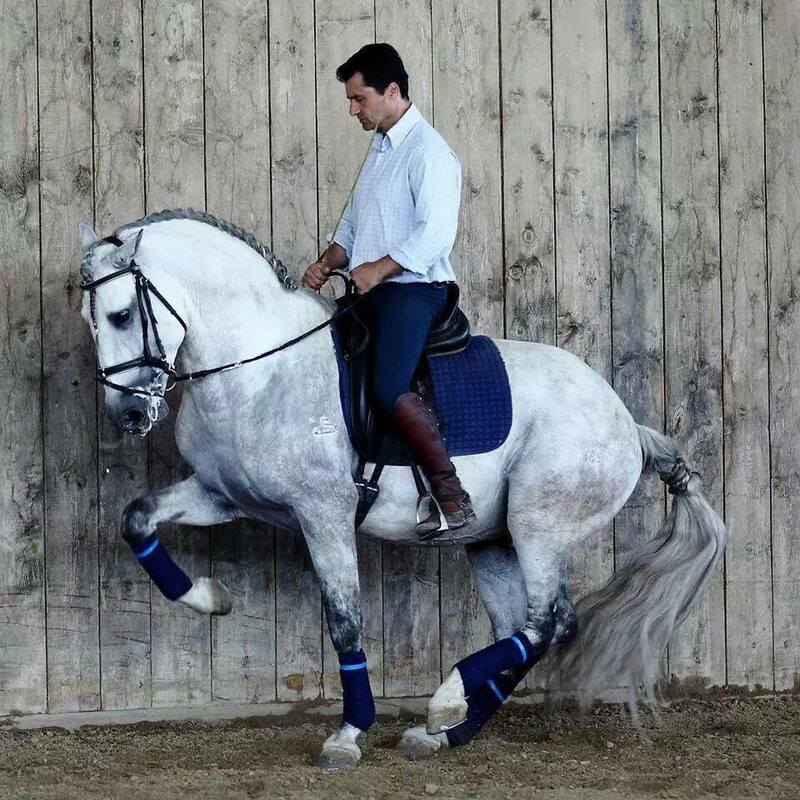 But the commitment that Andrea puts toward his ambitious sporting goals, has not caused him to lose the taste of performing in shows that, in addition to his ability in dressage and high school, also demonstrate his reckless skill as a vaulter. The path followed by another talented rider from Rome, Gianluca Coppetta, is in many ways parallel. He also combines participating at high levels in the national dressage competitions, with performances in national and international shows. 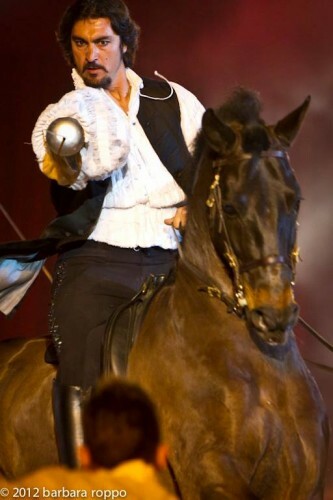 Gianluca was very much appreciated for his refined performances at Cheval Passion in Avignon, at the Salon du Cheval in Paris, and in the beautiful scenery of Piazza del Popolo in Rome, during the Roman Carnival. Even if Francesco Vedani’s character and curriculum are very different, it is certain that his exuberant personality, his extraordinary communicative verve and his equestrian culture, have contributed very much to the divulgation in our country of the principles of classical equitation, aspiring to an ideal of lightness. In addition to Francesco’s technical qualities, I especially appreciate his courage to challenge himself and his desire to have discussions with others on these subjects. Perhaps even arguing, but always animating a discussion on horsemanship that is food for the soul. Over the years, the solid professionalism of Silver Massarenti has been appreciated by many in this same light. Silver trained as a rider in Camargue and in Spain. He is not a rider who boasts, but he has established his own solid technical background. With Maria Baleri and Francesca and Riccardo Di Giovanni, he has also made a meritorious educational project, which brought horseback riding and the love for horses into many primary and secondary schools in the district of Travagliato, in the province of Bergamo. But there are still many names that could be noted in this article and, certainly, I am omitting too many of them to hope that someone will not take it to heart. But at least I would like to mention the talent of Giuseppe Cimarosa, the Sicilian rider who was able to give an artistic expression to his love for horses and turn it into a means of personal redemption and of public declaration against the Mafia. I also think that the efforts to spread, in small steps, a more correct view of classical dressage made by Francesco Nidoli, in Sicily, as well as by Michele Massarelli and Alessandro Tameni, in Brescia, should be appreciated. Likewise, I think, for certain, that the intentions of the Italian riders who refer to Philippe Karl’s Ecole de légèreté are positive. And it should not be forgotten the impulse given to the evolution of the Italian classical by the shows of the Roman Carnival. To this new generation of Italian riders I say: unite, talk to each other, collaborate, over come the individualism that has always been the primary limit of the Italian spirit. Do so, even if on certain things you may have different opinions. Confront each other. Become a group. Let your voice be heard like that of a significant entity of Italian equitation. Do not be content to remain mavericks. For too long in this milieu, people feared that by getting together, one person and their ideas would have to take precedence over another. In fact, it’s quite the opposite: together you will put each other in a better light. And above all, stop with sects. Stop with wars of religion. Classicists against show-jumpers, pro-Spaniards against pro-French, Lusophiles against Germanists, Baucherists against dressage lovers, Guelphs against Ghibellines. I can’t stand it anymore! But what are we talking about? In Italy, there are still people who believe that high school means make a horse scamper like monkey, trained by thrashing, while in the meantime you brawl because of your purists diatribes? When in Italy there is a real classical horsemanship movement, you can then have all the debates and the heated disputes you want, but today those who have a more serious and professional idea of this discipline have the duty to spread it and to work hard to give it the dignity it deserves. And this can be done only when you will put aside petty rivalries and small personal advantages and you will then begin to look to a horizon a little bit larger than that of your barn. Even beginning to dialogue with other equestrian disciplines. I have the privilege to ride in a beautiful equestrian center, where there are riders who compete at national and international level, mainly in three day eventing. I do not deny that, in the beginning when I arrived with my PRE, they looked at me as though I was a little strange. But as time passed, we got to know each other. And we understood that in the end we were not doing such different and opposite things. 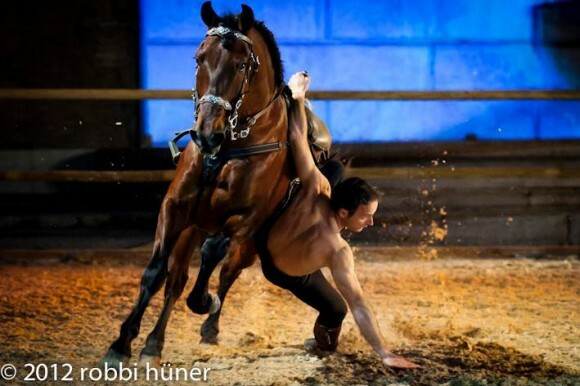 Indeed, knowing each other, we understood that the basis of good horsemanship is the same in all disciplines, whether jumping an obstacle, or performing a canter pirouette. 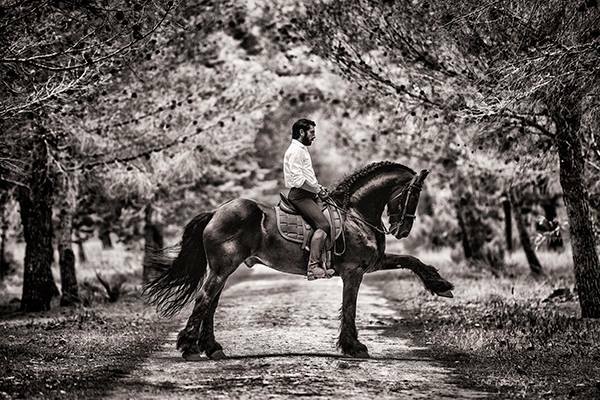 This is because the real basis of horsemanship is our love for these wonderful animals. And it is on the common ground of our respect and our dedication to horses, that we can, and we must, give strength and more attention to the Italian equestrian movement. Molto bello! Mi è venuta la pelle d’oca..